January PUG of the Month Winner - Galway! Congratulations to @Anne Walsh and @Martin Loughman and the Galway PUG for winning the January Challenge of the Month. Definitely having MVP @Ruth Pozuelo Martinez to launch our user group was the most exciting thing so far. Ruth demonstrated her famous "Billionaire" Power BI report and showed us how she put it all together. With 18,000 subscribers to her YouTube channel Curbal, she’s a great champion and promoter of Power BI across the world. We have a great venue. Mary Rodgers and Anthony Shaughnessy who manage The PorterShed in Galway have been instrumental in getting us this far. It’s a co-working centre in the heart of the city which also hosts events. There is a separate canteen for our networking / pizza break where we can keep the Power BI conversation going! Normally our meetings are held on the second last Tuesday of each month from 6 p.m. until 8 p.m.. Having this regularity definitely contributes towards its success. Also, as part of the routine for each evening, we kick off with a 40 minute presentation / demo, then 20 minutes of networking / pizzas which is then followed by the main speaker event. Lastly, and most importantly, it’s the members themselves which makes our group a success. As co-leaders we give presentations but other members do too. Questions are always most welcome. In fact part of our plans is to get demonstrations from more members and to look to how we can support them and their learning – to help them spread the Power BI message. We have great plans for 2019. Already we have MVPs @Ben Watt and @Jan Mulkens booked to speak to us in March and May respectively. Well-known speaker @Neil Hambly is visiting us from the UK in April. We’re really going to learn a lot from these three speakers! We are also in the process of setting up a managed test tenant for the group so that members can test out what Power BI Pro has to offer. Obviously, the big advantage of Power BI Pro is its sharing capabilities and opportunities to collaborate, but we also want to test the newly-added Dataflows feature. 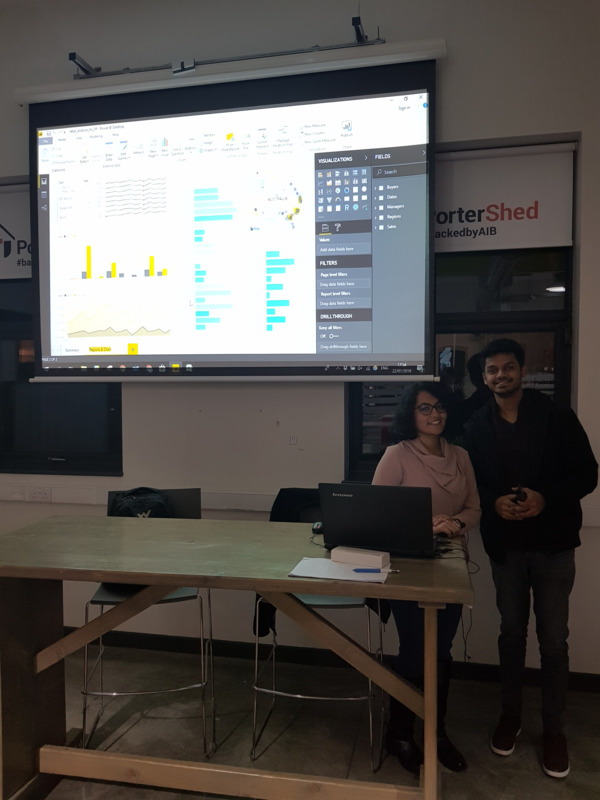 Photo: User group members Rohini Sreenivasalu and Ketan Bhadoriya who developed and presented a Power BI report to us in January. They are students at the local university, NUIG, doing Masters in Business Analytics.